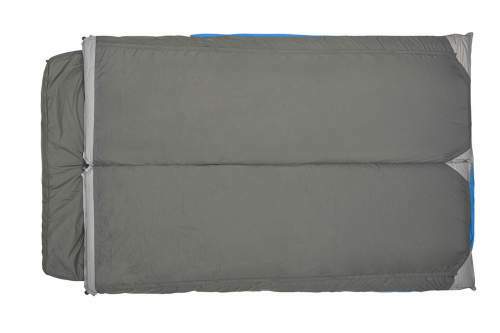 Sierra Designs Frontcountry Bed 35 Degree Duo Sleeping Bag is an innovative and comfortable zipperless camping bag with feet vents, a comforter, and a great price tag. Sierra Designs Frontcountry Bed 35 Degree Duo. They call this item the Frontcountry Bed, and it is based on the idea introduced earlier in their award-winning Backcountry Bed. It comes with some very cool features and a very affordable price. So this is a patent-pending zipperless design, you have an oversized comforter, and the main body of the Bed is such that it prevents drafts from all sides, the head included, and you still have a foot box somewhat similar to an ordinary bag. But they have added a cool feature here, you have feet vents, those are patented zipperless openings that allow you to extend your feet out of the bottom of the bag while still keeping the rest of the body insulated, see the picture below. The upper part of the bag around the head is similar to a large hood on ordinary bags, and its cut is such that you can put a pair of pillows. A really cool design without zippers and with feet vents. This is a design suitable for those who feel claustrophobic in a sleeping bag, I am one of those. This is why my initial thought was ‘what a great tool to use solo’, but it is not completely so. Namely, they have two sleeves on the bottom for two separate pads as you would expect from a duo tool, see the picture below. But one can always use it on any double-size pad without putting the pad in the sleeves. Though such sleeves are indeed a clever design because they keep the pads in place and you will not end up on the ground as it often happens to me as I turn around constantly. But even when used for two people, this is such a clever design with a large top opening, so getting in and out is easy and without disturbing your partner. On the other hand, the comforter allows you to turn around easily and to find your best position and to ventilate (or to close the space around you) as you find it necessary. They have also added insulated pockets in the comforter for arms and hands, they are visible in the picture above, they are located close to the edge of the comforter. With such a design you can easily tuck the sides of the comforter around you when temperatures drop. The bottom sleeves for two single pads. 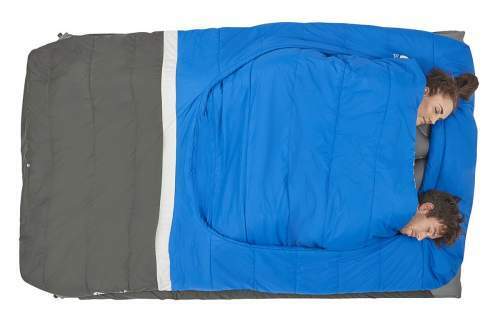 The foot box is similar to any ordinary sleeping bag but the comforter is something extra. Size-wise, obviously, this is a bag for couples and as I mentioned above eventually for solo use if you want lots of space; this is a huge rectangular structure with 106 inches (269 cm) circumference. Side view with a sleeping pad in the bottom sleeve. Weight-wise, this looks like a heavy tool, it weighs 7 lb 3 oz (3253 g). It is also rather bulky, with the packed size (L x D) 21 x 13 inches (53.3 x 33 cm). So this is a great camping tool and don’t plan to carry it around. Seasons-wise, the official temperature rating is 35 F (2 C), I would take this as the low limit, so this is a bag for summer camping. The insulation is synthetic and you have it 68.2 oz (1934 g), so this is around 60% of the weight. Such a synthetic insulation is usually far cheaper and you see it in the price here. But it has good sides, it dries much faster than a down and it will insulate you even when wet. So if you plan a trip in a wet and humid area, this is the type to choose. The shell is quite strong 50D polyester ripstop, and the liner is even more robust 68D polyester taffeta. So you realize this is far stronger than what you have in bags designed for the backpacks, see for example this Nemo Ramsey 30, or Exped Versa Quilt. A bit heavy & bulky. Foot vent on the bottom. Why? This bag looks heavy but you will be able to compare it with some of its competitors below. It is so bulky because of the fill, synthetic materials are never as compressible as down. I assume they have had reasons to put vents on the bottom, just wonder if they would be more useful on the upper body of the foot box. 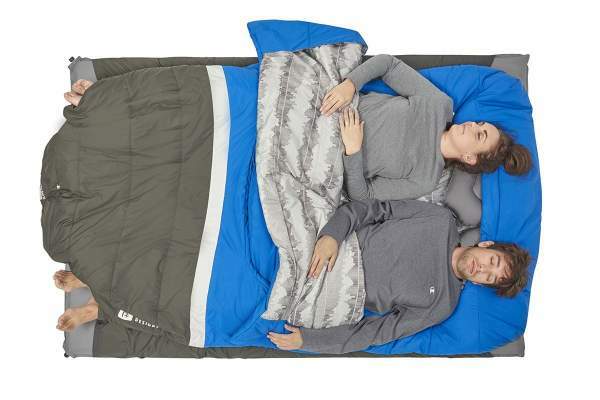 Type: rectangular duo zipperless sleeping bag. Weight: 7 lb 3 oz (3253 g). EN Limit Temp Rating: 27 F (-3 C). EN Comfort Temp Rating: 37 F (3 C). Packed size (L x D): 21 x 13 in (53.3 x 33 cm). Fits: 6 ft 4 in (193 cm). Circumference (shoulders, hips, feet): 106 in (269 cm). Fill weight: 68.2 oz (1934 g). I have chosen quite different items to show you, to realize what you can expect dependent on the materials. The two others in the table below are just standard bags, but the NEMO bag is with a high quality down fill, and you realize this from its weight and the packed size. But see also the prices, they are, respectively, $144, 134, 330. Please follow the links to read more, those are great items. As you realize, this Sierra Designs Frontcountry Bed 35 Degree Duo is a really nice item with some innovative details. But this is not surprising for this brand that has been around since 1965 with many completely new designs. So this is a reliable brand and you have a quality item here, I can fully recommend it. Note that they also have the Queen size version of this bag and a Single version as well. But if you need to see more, please check my page with sleeping bags. In particular, see my list with double-size bags and check also this new model the Nemo Jazz Duo 20-Degree Sleeping Bag. Please use the comment box below in the case of questions and comments. 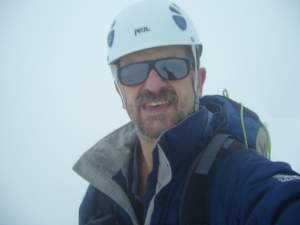 Have a nice day and great camping if you are planning to go somewhere, I am just in the process of packing for a trip to Slovenian Alps.